Great Make Do & Mend Session! Thanks to all who came to & assisted with our Make Do & Mend Session at the Kindle Centre on Saturday! 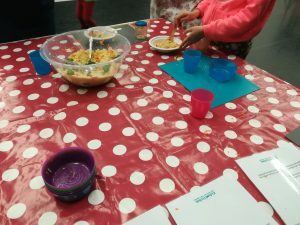 The kids enjoyed taking part in Kids’ Kitchen’s cooking activities, while Mums, Dads, Grannies and Grandpas had their bikes, household items and clothes repaired and revamped. Much clothes swapping also took place alongside. We’re going to do this all again on October 13th from 10am at the Kindle Centre during h.Energy weekend, so you’ll have another opportunity to clothes swap and get items repaired – all for free! that session with a big communal feast at lunch time prepared by Growing Local and the local community. Do get in touch if you’d like to know more… email: admin@hgnetwork.org. « Stop the Solar Attack!